Other societies looked at death differently than we do. Death was just a natural and inevitible part of life. A very large number of babies died within the first month of life. A large percentage of children never reached the age of maturity. Minor illness, which would have little affect on our lives, was life threatening and often resulted in death. Accidents which we would consider to be minor emergencies often resulted in a quick death. Even as adults reached "middle age", more serious problems such as cancer, heart attacks, digestive or excretory problems which are easily treated today often resulted in death within a short period of time. Consequently the attitudes of these people were in sharp contrast to our own. 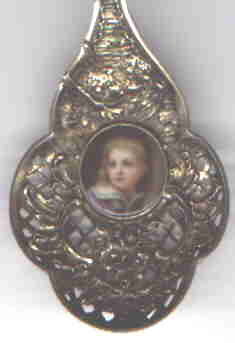 Spoon used as remembrances of someone special have a long history. 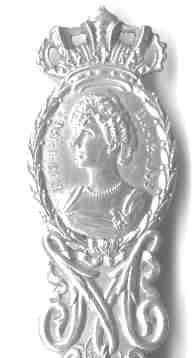 According to Graham Hood in "American Silver" spoons such as the one pictured below "were frequently given to pallbearers at funerals and marked with the deceased's name, age, and the date." The spoon shown below dates ca. 1670-90 and belongs to the Yale University Art Gallery and is part of the Mabel Brady Garvan Collection. Spoons in this style are characteristically of Dutch descent. 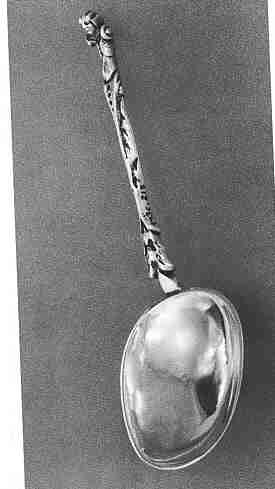 (This spoon is a very early American colonial spoon). Even though these spoons were once "frequent", Mr. Hood states that very few are known today. Periodically a spoon that is not only unique but also extraordinarily beautiful is discovered. As you can tell from this museum, I have looked at hundreds of thousands of spoons. Most of the really beautiful and unique spoons which I have seen are not available for purchase as they are either owned by a serious collector or in a museum collection. I have recently been able to acquire a spoon which was made as a remembrance for a young boy, but it is so beautifully done that even a "jaded spoon expert" (myself) had to catch his breath. This spoon was probably made in Austria or Germany in the last quarter of the 19th century and it has an 800 silver mark. It also has a mark which looks like a pine tree in a diamond shaped cartouche. The handle is porcelain which is decorated with blue, gold, red and white. I have shown the front and back views of the handle. The design is in the round. The hand painted portrait in the center is delicate and poignant. 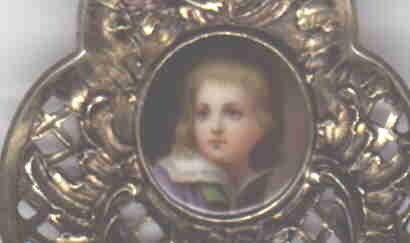 I am not sure what material is used as the portrait base, but from observations of other jewelry in this style, I suspect that it is ivory. Now if I could only figure out which family created this beautiful spoon. 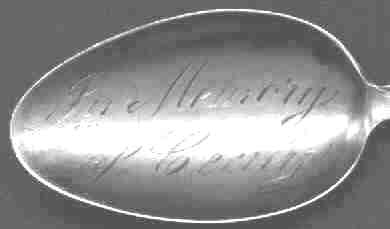 In 1906 someone made a conventional state handled Wisconsin spoon into a funeral spoon by having it engraved "In Memory of Cecily". This spoon is probably a souvenir funeral spoon. When Franklin Delano Roosevelt died in his fourth term as President, much of the population was very upset. I would suspect that this spoon dates to 1945. The finial is a cutout bust of the President and below it says "Warm Springs, Ga." (Georgia) which was where he died.